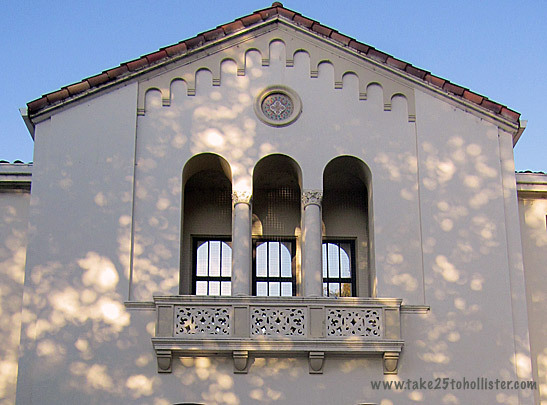 The balcony and the tower on the main building at San Benito High School have always been my favorite features of that building. Whenever I glanced at them when I was a student there many years ago, I felt like I was in another world. The school's oldest building was built around 1910. Some people say they may have been designed by W.H. Weeks, a popular architect who created the building plans for many schools, libraries, and residences in Central and Northern California. 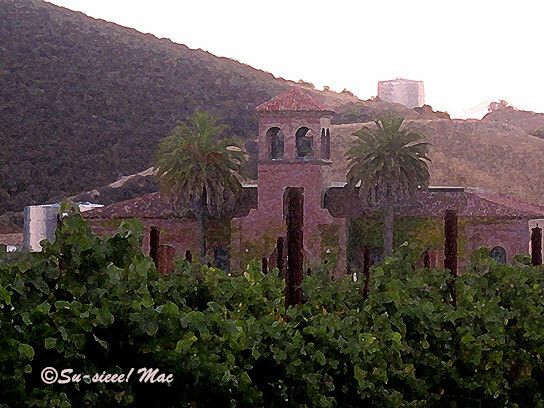 This is tasting room for the Pietra Santa Winery in the Cienega Valley above Hollister. I always forget how beautiful and magical it is up by the winery. Pietra Santa is Italian for Sacred Stone. 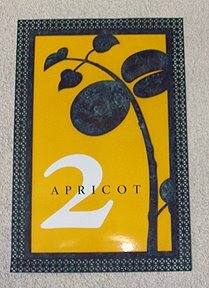 The sacred stone in this case is the amazing soil from which grape vines and olive trees grow to produce crops for award winning wines and olive oils. To learn more about Pietra Santa, check out its website or Facebook page. 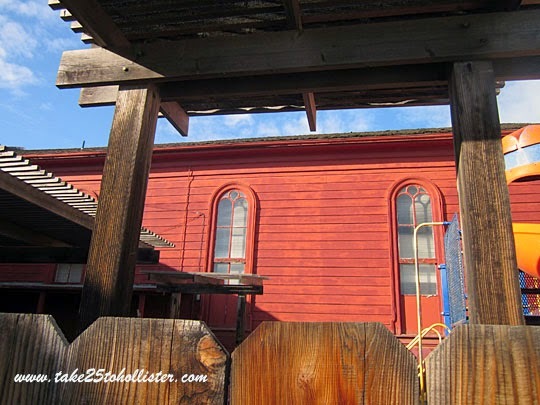 This past week I've been posting photos of San Juan Bautista, the second biggest city in San Benito County. The biggest? 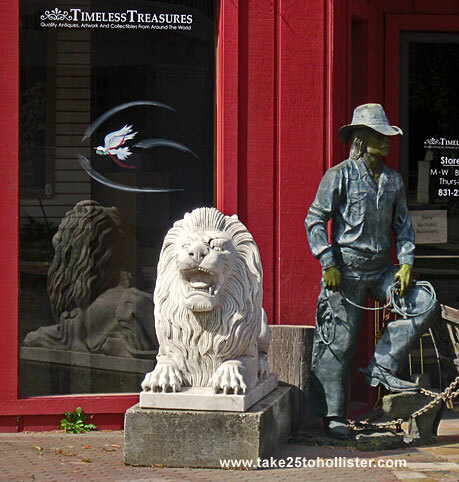 Hollister, of course. Here are a few more random look-sees around this grand old town of San Juan. While I was walking around San Juan Bautista earlier this week, I kept coming across amazing things that showed how people and groups appreciate each other. 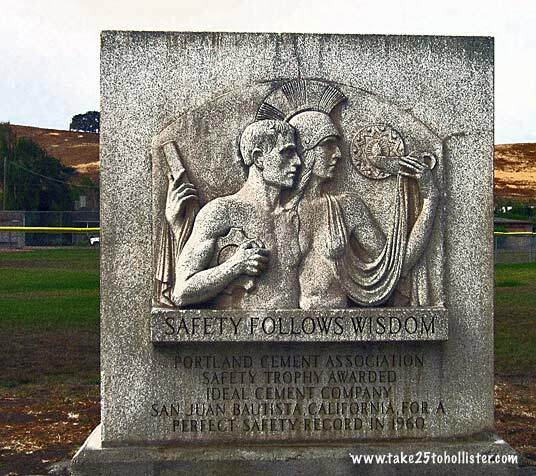 For instance, the dedication of a bench to someone; the restoration of an old, old residence to its original look; and the display of a company's safety award within the community rather than at the company itself. Seeing all this made me feel good. 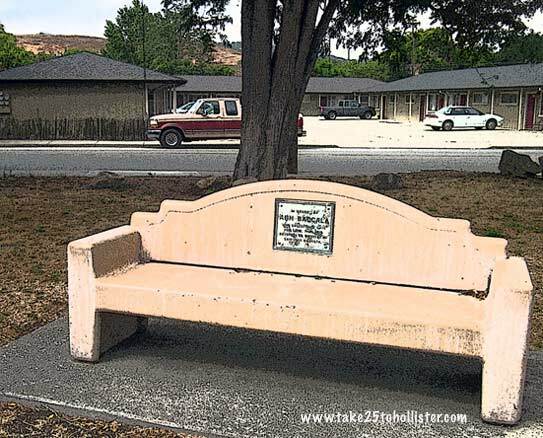 Located amongst the trees in the Carl Martin Luck Memorial Park is a concrete bench dedicated to Ann Baccala, who was a major figure the San Juan community. The plaque on the bench reads: "In memory of Ann Baccala who unselfishly gave her love, time, and devotion to the City of San Juan Bautista." 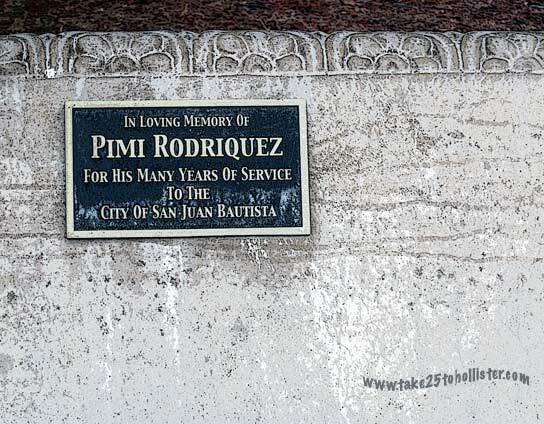 Under the trees at Abbe Recreational Park is a concrete bench dedicated to Pimi Rodriquez, who was San Juan's public works chief for many years. I came across this 1993 article about San Juan in which the reporter wrote how Rodriquez worked without pay because of budget problems. 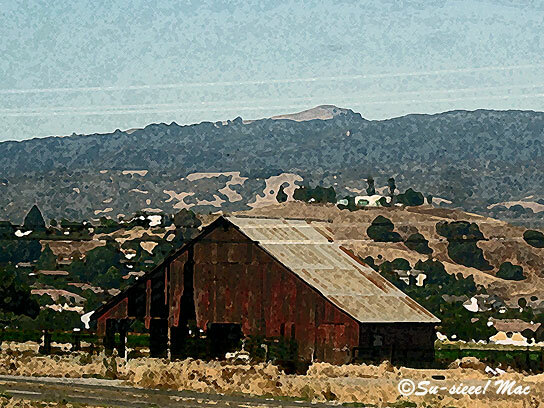 This fading red barn is near the south end of Fairview Road, just past Maranatha Drive. In the distance is the Gabilan range. 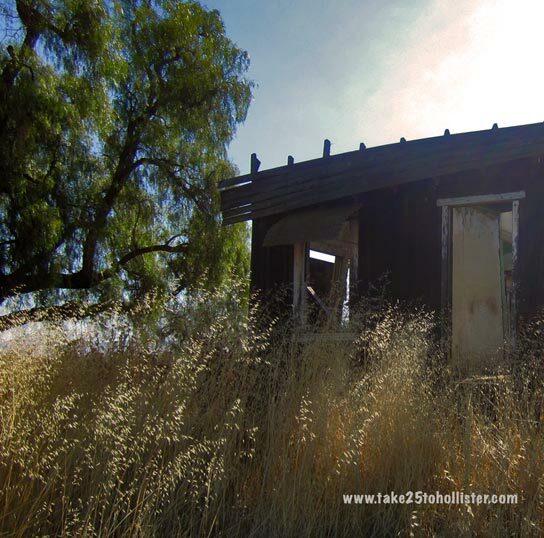 Every time I pass by the run down, abandoned house on the corner of Fairview and John Smith Road, I think photo opp. I finally stopped there the other morning when something got in my eye while pedaling my bike. I wonder what the story is behind the house. Whoever had lived there once upon a time liked pepper trees. The trees are gorgeous. When I was a first grader in 1960, I had to wait for the bus at the corner of Shore Road and San Felipe Road, across from Dunneville Market, in front of old rumble-tumble abandoned buildings. A lot of times I was by myself. It could get pretty spooky for a kid with a crazy imagination. 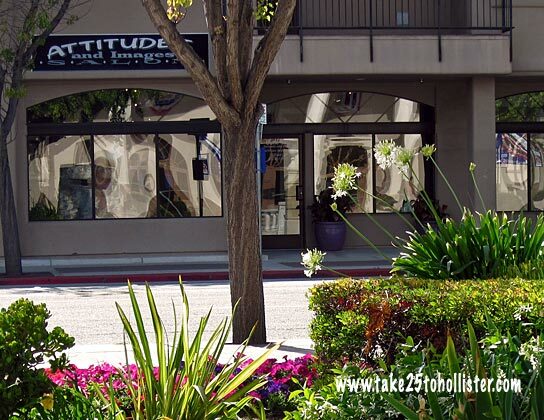 Check out the reflection of the Veterans' Building in the windows of the Attitudes & Images Salon on San Benito Street. You might say that the reflected image has a pretty cool attitude. Today's archival piece is about the gorgeous downtown parking garage on Fourth Street, which you enter via the parking lot on Fifth Street. FYI: I edited the story just a bit. An Art Museum? A Vista Point? We have million-dollar art to check out for free in Hollister. 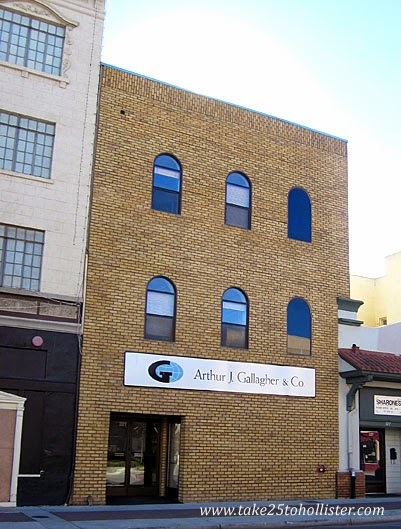 Head over to the Briggs Building, which is near the corner of San Benito Street & Fourth Street. That’s the parking garage. That’s right, I wrote parking garage. You can't miss it. It’s a four-story structure, the tallest one in town. It was built in the 1990s for about $6 million with RDA funds. At full capacity, it can hold about 140 vehicles, so I’ve read. I know, that’s a lot of taxpayers' pennies. Few people use the parking garage. Maybe the building is just too beautiful to park in. Seriously, the building itself is a piece of art. If I didn’t know it was a parking lot, I would say it was a school (Gavilan College does hold classes on the first floor). Maybe a government building or a fancy department store. Maybe even an art museum, which brings me back to the topic of seeing some fine art there. 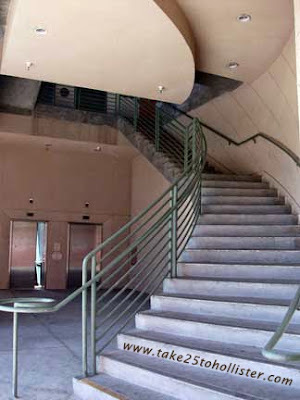 Start your tour by the stairway next to the elevator on the southeast corner of the building. First, admire the aesthetics of the stairway design. Now, start walking up the stairs. Sure, you can take the elevator but there’s more joy in suddenly coming upon each piece of art as you gaspingly reach the top of a floor. Pause at the top of each floor for your breath. Also, take note of the beauty of the art piece telling you what floor you’re on. On the rooftop, I noticed a few more of these art pieces telling me I’m on the fourth floor. So I assume that’s the case on the other floors. To tell you the truth, I no longer was interested in seeing and viewing man-made art when I came out on the rooftop. I was immediately astounded by the view of Hollister and the mountain ranges that surround it. 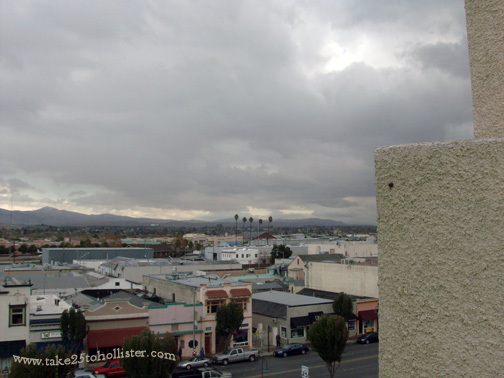 The almost 360-degree view of Hollister is worth an occasional trip to the top of the roof of Hollister’s multi-million dollar parking garage. There you have it: an arts museum and a vista point. Plus, you can park there. As some of you dear readers know, I like to walk with the Husband through the alleys of Hollister. In some alleys, we get a sense of a time gone by. In the alleys in the Downtown Hollister Historical District, we see perspectives and angles of the buildings that are rather interesting and exciting. 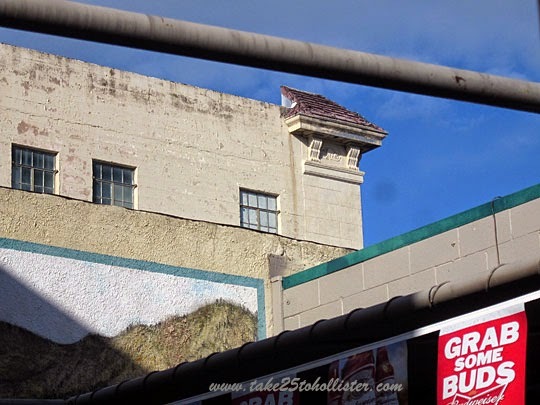 So, today, I'm sharing a few sights that we recently saw in Wentz Alley, between Monterey and San Benito Streets. 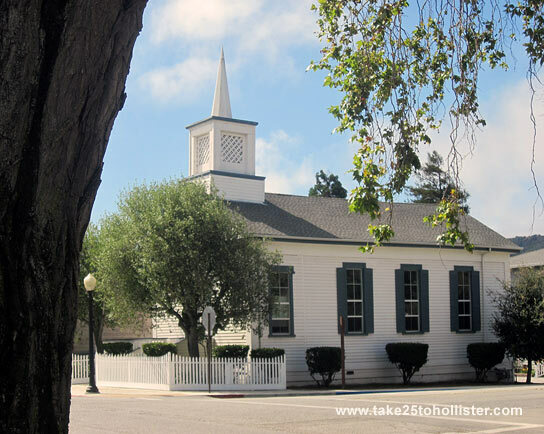 The Hollister United Methodist Church started as the Methodist Episcopal Church, South in 1862. Ten years later, the church constructed its first building, a wooden structure, on the corner of Fifth and Monterey Streets. When the brick building was raised in 1910, the wooden structure became the church's social hall, which is visible from Wentz Alley. Quickly take a look at these historic buildings on Fifth Street. 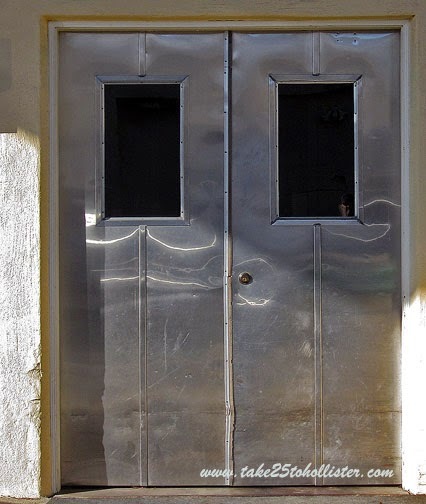 At which building do you think you would find these handsome heavy industrial doors on its backside? Go ahead, I'll wait. Did you choose the Ross Building (345 Fifth Street)? The building looks so delicate and petite to have these doors, but yet that's where you'll see them. The original owner configured the office building so that it could easily be turned into a supermarket if, at anytime he, or a future buyer, wanted to do so. I like this alley view of Downtown Hollister from behind Johnny's Bar and Grill. It's an interesting intersection of lines of the various buildings, don't you think? Dear Readers, I'm introducing a new weekly feature called A Sunday Flashback today. 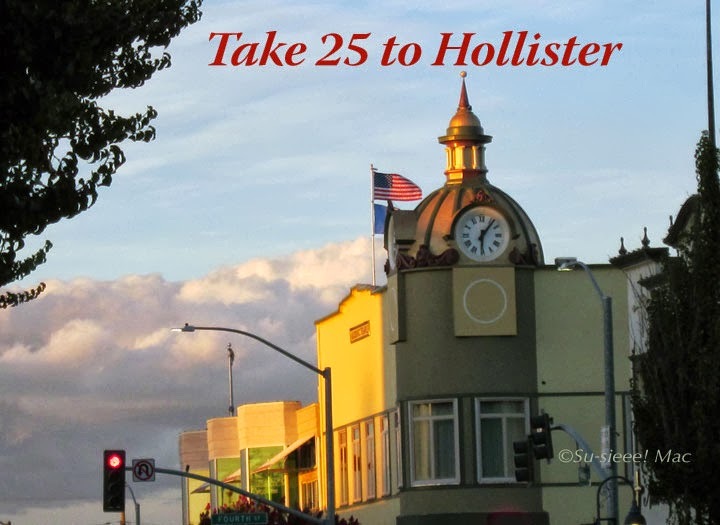 Last week, I needed to go through my photo archive for Take 25 to Hollister and I was quite overwhelmed by the number of photos, as well as amazed at how some things around the county have changed just within the past 10 years. 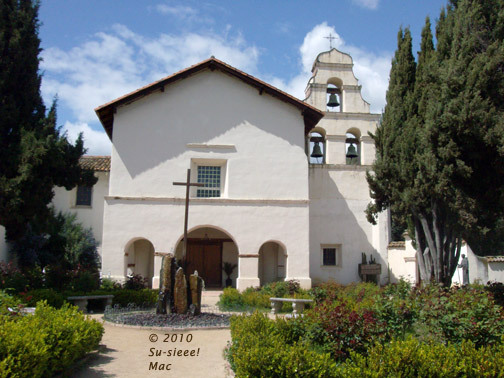 Mission San Juan Bautista, for instance. Who remembers the bells being out in front of the church entrance? 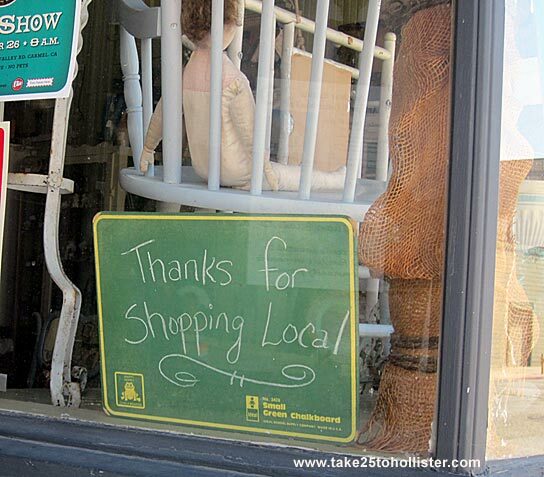 I don't, even while I look at the photo I took in 2006. So, when did the change take place? In 2010, the mission went through another restoration and a bell wall was added to the church. FLASH UPDATE: The husband has just informed me that the above photo is not of Mission San Juan Bautista, but of Mission San Antonio de Padua! 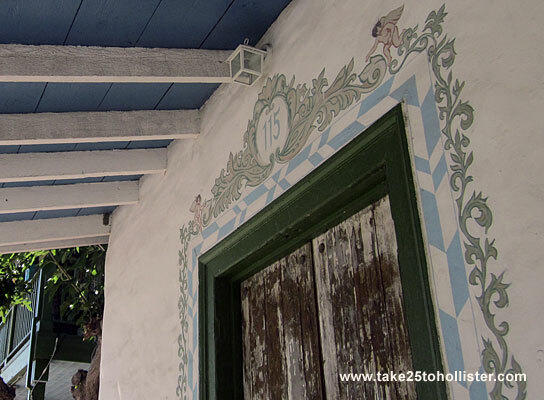 He said that he'd always seen Mission San Juan Bautista as painted white, so he started looking back at all the missions we have visited. Thank you, Husband! No wonder I couldn't recall Mission San Juan Bautista looking that way before 2010. So much for the the first Sunday Flashback. LOL! 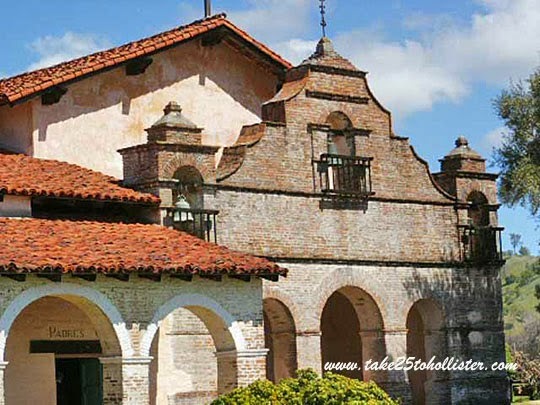 This is definitely Mission San Juan Bautista! 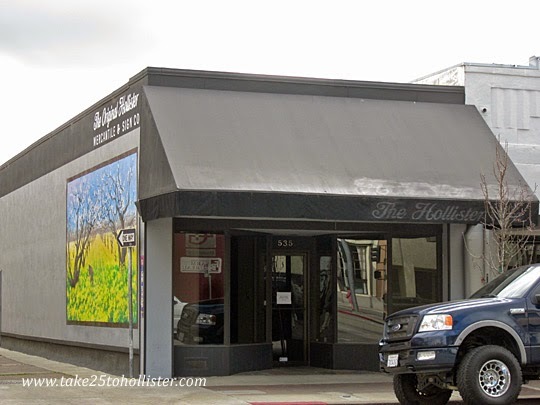 You've probably noticed that Downtown Hollister has several "new" and large buildings on its main street, which are quite compatible in look with the historic buildings. These modern buildings were constructed in the 1990s after the original buildings were destroyed by an earthquake or fire. 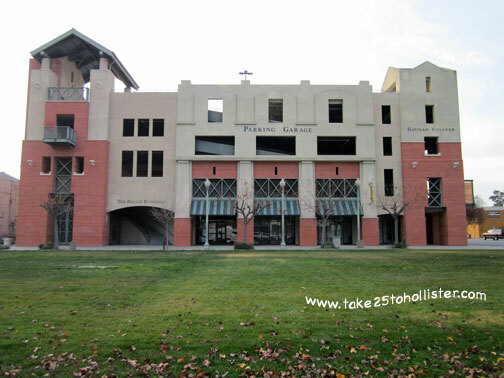 The 1989 Loma Prieta Earthquake changed the face of Downtown Hollister in a very big way. The original buildings on the northwest corner of San Benito and Fourth Street collapsed in the earthquake and the commercial buildings that once stood on the lawn in front of the Briggs Building were so unsafe that they were razed a few days later. The structural integrity of a few other buildings was found to be poor so they were demolished, too. The following year, more commercial buildings in Downtown Hollister were destroyed by arson fires. 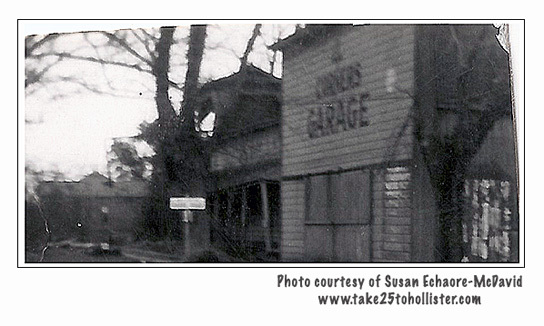 Obviously, the devastation, along with a drought and economic recession, did not stop the people of Hollister back then. 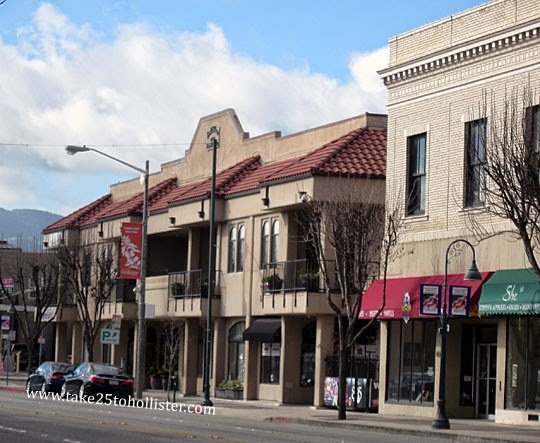 With the help of redevelopment and other grants, they constructed the following handsome buildings in the Downtown Hollister Historic District, which is in the National Register of Historic Places. 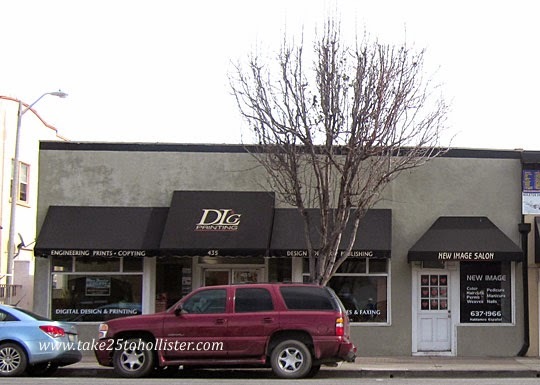 Okey-dokey, here is the last group of noncontributing historic buildings to the Downtown Hollister Historic District, which is listed in the National Register of Historic Places. I'm not completely done with the series though. Come back tomorrow to see photos of buildings within this historic district that went up after the district was entered into the National Register in 1992. This historic one-story building was constructed around 1920. I think it may have been built for J.C. Penney. As a kid in the 1950s and 1960s, I knew this building as the Baughman's Department Store. In the 1980s, Ford Department Store opened there. 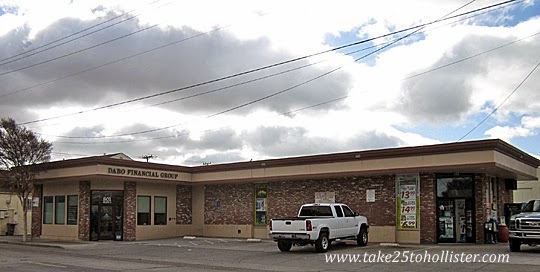 Today, the building has two sections, with the San Benito County Esperanza Center occupying the south side and Discount Furniture on the north side. 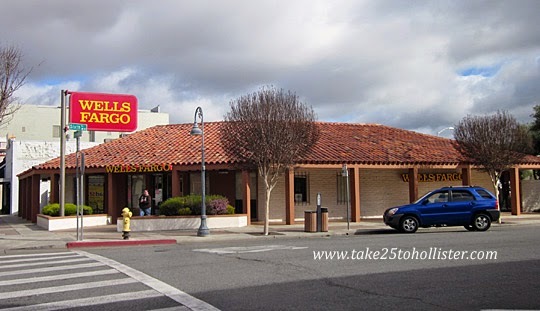 The commercial building that Wells Fargo occupies today was built around 1975. The notes in the National Register of Historic Places state the building "...is the district's only example of strikingly incompatible design." Perhaps. The building is beautiful. 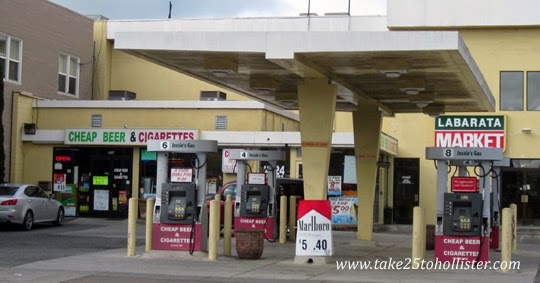 The gas station at the southwest corner of San Benito and Seventh Streets has been a gas station for as long as I can remember. Several buildings has gone up on this site over the decades. The noncontributing building cited by the National Register of Historic Places is the smallest building behind the gas pumps. That's the one on the left with the sign Cheap Beer and Cigarettes. It was built in the mid-1970s. This quaint looking one-story building was constructed around 1920.The original architectural features that remain are the recessed panels on each end of the building. Sears Catalog once occupied the building. Today it is the home to Metropolis. 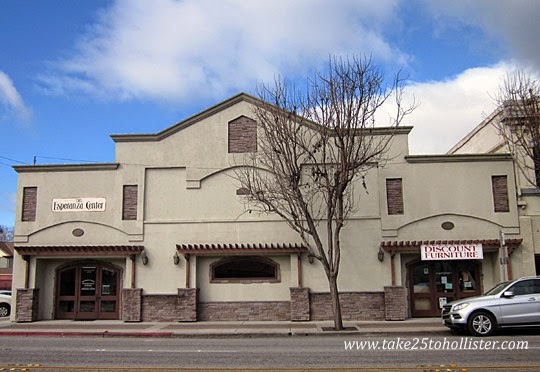 Interestingly, this historic building sits between an empty lot (which was once a theater) and one of the newer buildings in Downtown Hollister. The original buildings were damaged in the 1989 Loma Prieta Earthquake. Many old-time locals will remember this site as the home to Baywood Creamery, which had been there before 1970 when this reinforced concrete building was constructed. 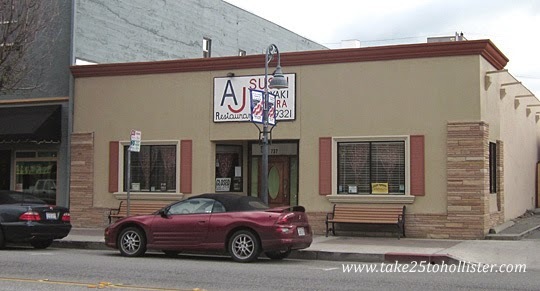 This "new" building is currently occupied by AJ Sushi. Constructed around 1960, the long section of the L-shaped historic building has always been a liquor store, while the smaller section was an office. 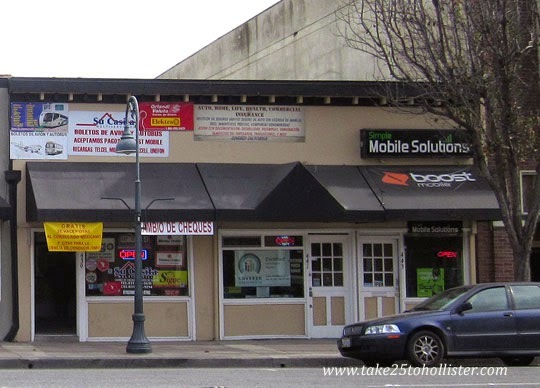 The businesses occupying the spaces today are the Pacheco's Express Way Liquor Store and Dabo Financial Group. 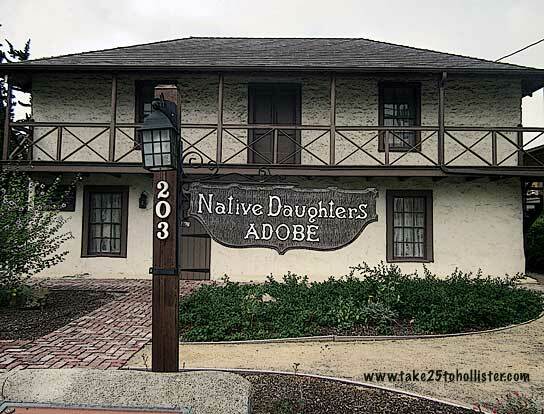 To check out the other noncontributing historic buildings to the Downtown Hollister Historic District, please click here. 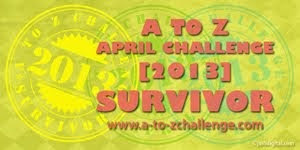 To check out the contributing buildings, please click here. Today and tomorrow, I cover the last of the noncontributing buildings in the Downtown Hollister Historic District, which is listed in the National Register of Historic Places. Even though some of these historic buildings were constructed between 1880 and 1942, they are categorized as noncontributors because their original material and/or architectural details were removed during alterations. This one-story commercial building was constructed around 1900. The notes in the National Register of Historic Places describe this building as having "...a gable roof masked on the front (west) elevation by a simple rectangular parapet." There must've been a remodel after the early 1990s that removed the gable roof and added the second storefront on the south side of the building. Occupying this site today is Design Line & Granger Printing (435 San Benito Street) and New Image Salon (437 San Benito Street). 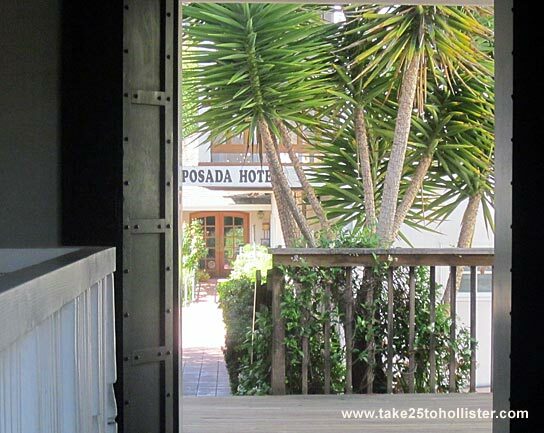 Built around 1920, this commercial edifice originally was one storefront listed as 443 San Benito Street. In the 1940s, it was divided into two sections. 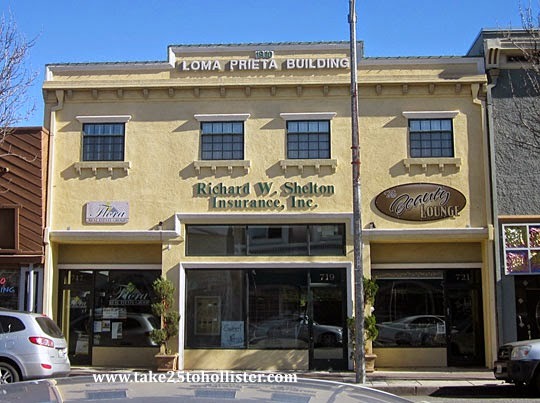 Today, the building is occupied by three businesses: Su Casita Multiservicios (439 San Benito Street), Aristotle Insurance Agency (441 San Benito Street), and Simple Mobile Solutions (443 San Benito Street). 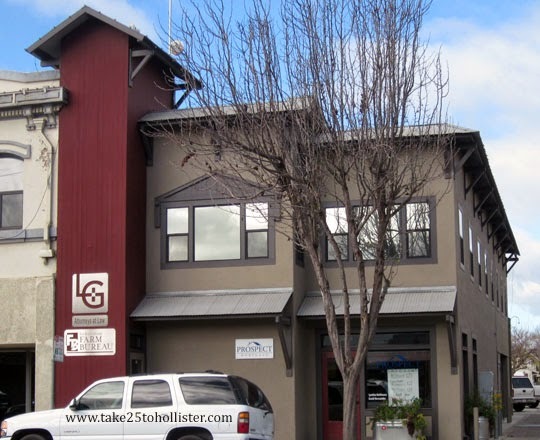 Here is another historic commercial building in Downtown Hollister that has been divided into two sections so it seems like separate buildings. This building was constructed around 1900. The entry way to the southern section is beautifully paved with bricks. 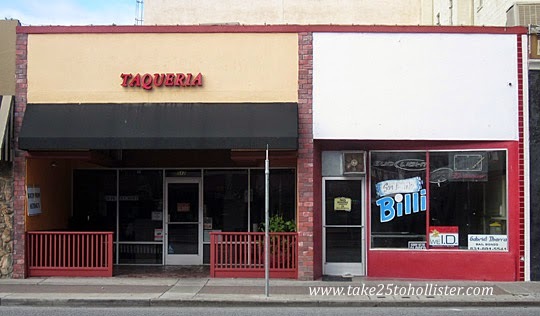 La Villa de Jerez Taqueria occupies the storefront at 512 San Benito Street. The one at 510 San Benito Street is vacant. This building was also constructed around 1900, possibly the same time as its neighbor on its north flank. 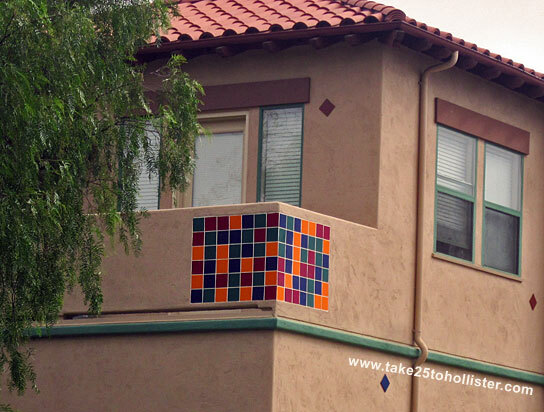 A false stone siding gives it a look unique from other buildings in the Downtown Hollister Historic District. 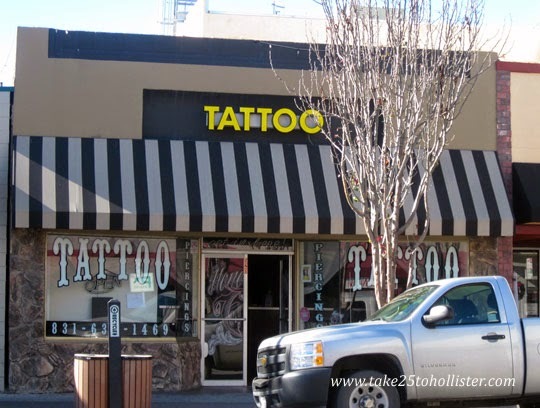 Only the Honorable Tattoos & Body Piercings occupies this site today. This one-story concrete-block building was constructed in the early 1950s, according to the National Register of Historic Places. But, I wonder whether that's correct. 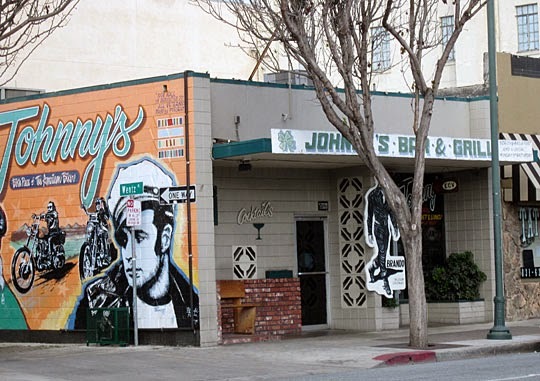 In 1947, bikers during the so-called Hollister Riot drove through Johnny's Bar & Grill, which continues to occupy the building today. This one-story commercial building was constructed around 1950. 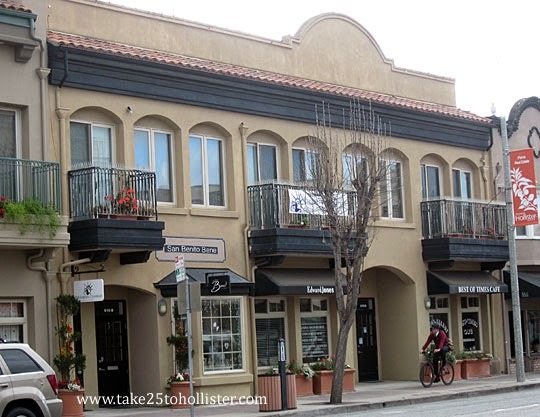 The architect did a great job designing it to blend in with the look of the other buildings in Downtown Hollister. The storefront has an attached garage in the rear that opens to Briggs Alley. 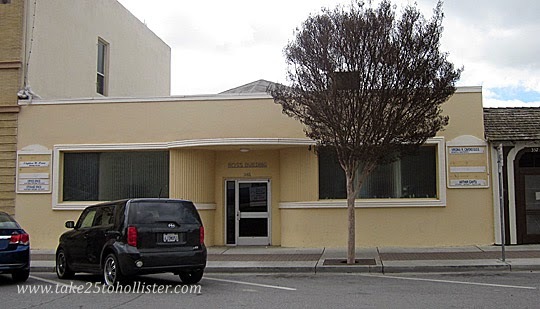 The Hollister Sign Company is located in the garage space, while the storefront is currently vacant. 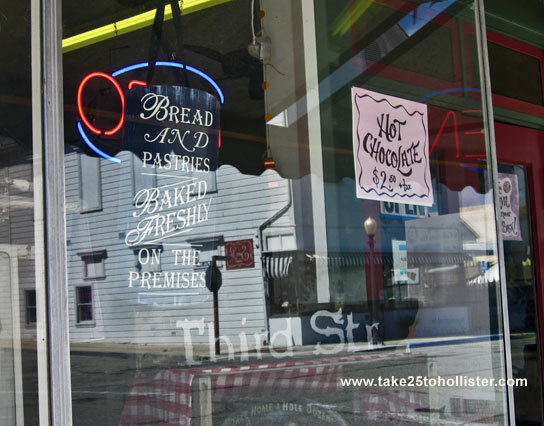 Over the past six weeks, I posted photos of over 40 contributing buildings to the Downtown Hollister Historic District. To check out those posts, please click here. 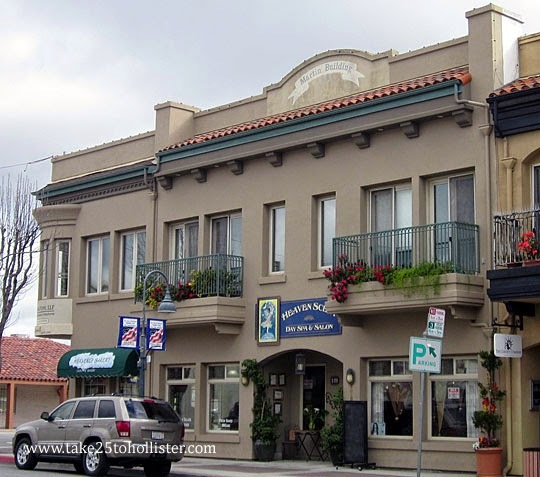 Today's post covers the noncontributing buildings in the Downtown Hollister Historic District on Fifth Street, between San Benito and Monterey Streets, and on Sixth Street. 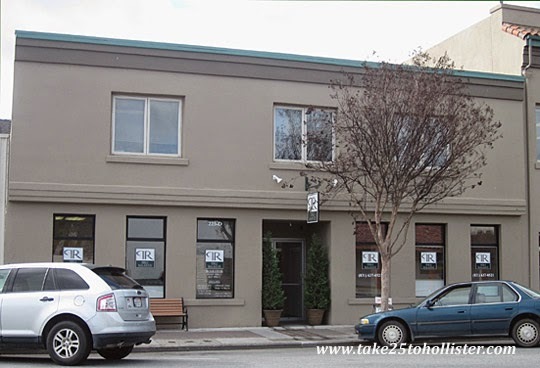 This three-story brick commercial building was constructed around 1985. Sometimes I think I'm looking at the side of the building rather than the face. It could be because the lot is narrow compared to the other sites on the street. 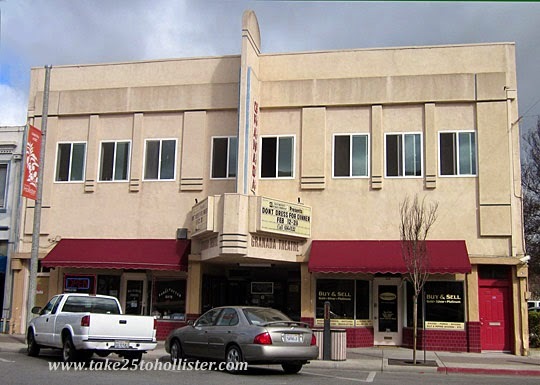 I was surprised to learn that the Granada Theater building is not a contributing building to the Downtown Hollister Historic District. It's categorized as a noncontributor because many of the building's original architectural details were removed. The two-story reinforced concrete building was constructed around 1940. This handsome office building is formally known as the Ross Building. It was constructed around 1948. To learn a bit more about it, please click here. 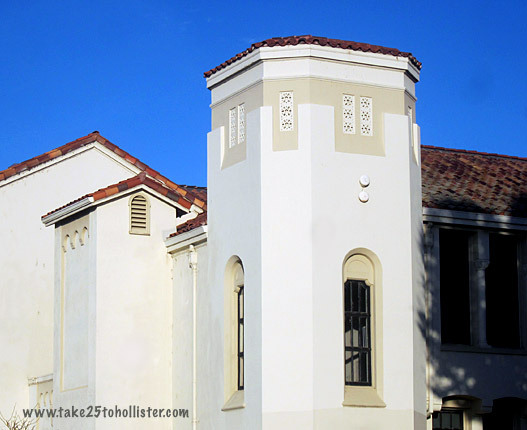 This two-story historic building is another of the more modern buildings in the Downtown Hollister Historic District. It was constructed in the late 1970s. Today, Pierce Real Estate occupies the building.